Planning to transition a transit fleet from CNG to zero-emission buses? Think about the fueling/charging infrastructure. Many transit authorities, having invested in low-emissions compressed natural gas (CNG) powered buses, are now looking to drive bus emissions to zero, by adding zero-emission buses (ZEB) to their fleets. How Do Different Types of Zero-Emission Buses Compare? While battery powered electric buses are less expensive to purchase, their operating range can limit implementation. Longer or hilly routes that CNG buses handle with ease can be impractical with battery-powered buses. And in extreme weather conditions, battery power is reduced, for shorter operating ranges and less climbing power. Only fuel cell electric buses are a one-for-one direct replacement for CNG bus routes, offering similar range and operability. Unlike battery electric buses that require a total replacement of the existing fueling infrastructure, FCEBs can use hydrogen generated from a fuel feedstock common to CNG buses (natural gas). 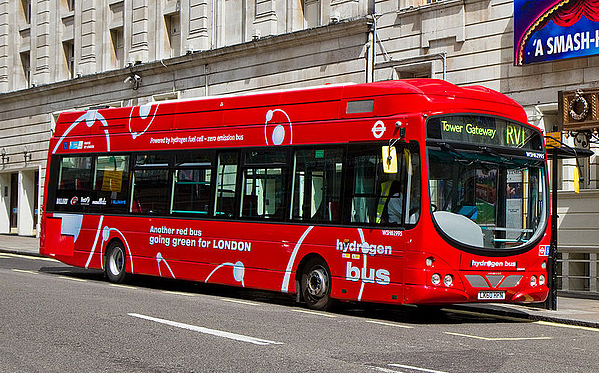 For hydrogen fuel cell electric buses, the hydrogen refueling network can be developed by leveraging the existing CNG network. Two transit operators have begun the transition from CNG to hydrogen fuel cell buses. Sunline Transit in Cochella Valley and OCTA Transit in Orange County California have mixed CNG and FCEB fleets. If you’re planning on making the transition from CNG to zero emission buses, you’ll need to consider the different types of ZEBs available. Although all ZEBs can help you meet the zero emissions mandate, hydrogen fuel cell buses have the advantage in that they can operate like CNG buses using similar scalable refuelling infrastructure. Join in the conversation. What are your thoughts on making the transition from CNG to zero emission buses? Download our free white paper to learn about flexible fueling solutions for European transit operators.